Apple iAds Launched: Engage. Captivate. Connect. The much ballyhooed launch of Apple iAds, Apple’s new advertising product has begun with the following slogan: Engage, Captivate, Connect. I couldn’t have described the purpose of brand advertising better myself. Problem is… that’s all iAds will ever be – a brand advertising platform. Because Apple App users hire apps to do its app job first – not advertise to them. 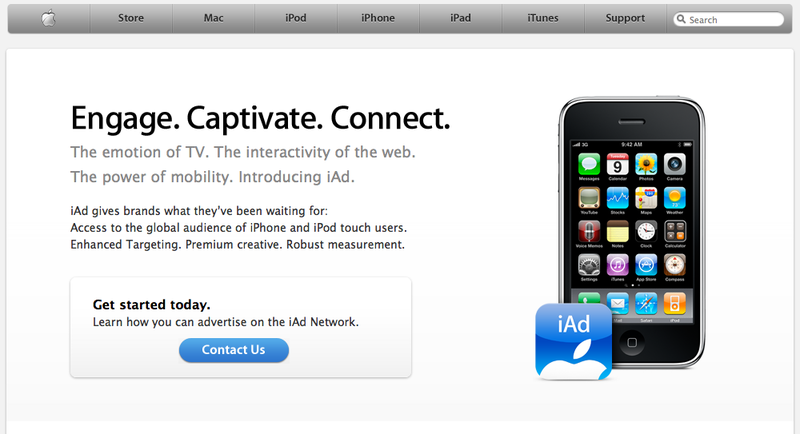 Apple iAds are no different than any other media trying to capture the attention of its audience. Engaging the app audience is no guarantee iAds will measurably lift its advertisers brand awareness in the consumers mind any more than any other device or media would. As much as I love Apple and all of their products – its the only brand of computer, phone or reader I own – their iAds product will do little to disrupt and reshape the mobile advertising marketplace beyond that which its device counterparts are already on track to do. This entry was posted on July 1, 2010 at 3:05 pm and is filed under Apple iAds Launched, Engage Captivate Connect. You can follow any responses to this entry through the RSS 2.0 feed. You can leave a response, or trackback from your own site.